Heat pump water heaters (HPWHs) are a more efficient way to heat water than standard electric or gas cylinders. They typically absorb energy from the outdoor air, the ground or water bodies (lakes, ponds) to heat water, which is stored in an insulated cylinder. An integral heat pump hot water cylinder is usually sited outside. A well-designed and installed system uses significantly less energy than standard electric or gas cylinders. Heat pump water heaters can work in places that aren’t good for solar water heaters – places that get less sun, like the south side of hills. Energy savings are less dependent on daily hot water usage patterns (eg when you shower) compared with solar hot water. If cheaper night-rate electricity is available in your area, some models can take advantage of it. Check with your electricity supplier and, if it’s available, get your cylinder sized so you can use it. A heat pump water heater transfers heat from an outside heat source (usually the ambient heat in air) into a hot water tank and uses a compressor/condenser/evaporator to raise the water temperature, the reverse of the way a fridge works. Heat pump systems use electrical energy only to ‘move’ the heat – they don’t actually ‘make’ heat. This makes heat pump systems much more efficient than traditional electric or gas water heaters. Some systems incorporate an electric element booster, for when the air is too cold for the heat pump to extract heat efficiently, while other systems can operate at very low temperatures and still produce enough hot water at good efficiencies. There are also systems that are designed to be used only in warmer areas.The actual efficiency that you would get from a heat pump water heater depends on the make of the system, the quality of the installation, the average temperatures where you live, the amount of hot water you use and the location of the compressor unit. Some systems work better in cold climates than others (see below for further detail on use in cold climates). Systems that use an electric booster (backup element) in cold conditions can be more expensive to run. Many HPWHs operate essentially as electric systems below 7°C. If using these systems, ensure that they are on a timer to operate during the daytime only. Otherwise they are An integral heat pump hot water cylinder is usually sited outside. Photos: BRANZ Bulletin 529 Dec 2010 effectively an electric system at night for up to 6 months a year. The upfront cost of heat pump water heating is expensive compared with electric or gas, but has become more affordable. In many cases you will need a building consent to install a heat pump water heater. Check with your council. 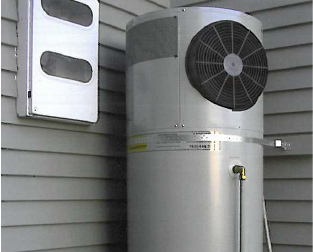 A split heat pump hot water system – the cylinder can be inside the house. There are two different types of heat pump water heater, split systems and all-in-one or integral units. Split systems have the compressor unit outside and the hot water tank generally inside although the tank can also be located outside the house separate from the compressor. In some cases you can use your existing tank. All-in-one units have the compressor and tank together and the whole system usually sits outside (although an indoor unit is being developed, which is ducted to the outside). Generally, the hotter the outside air, the better the heat pump runs. Heat pump water heaters tend to work best in areas with average air temperatures above 7°C. But the better systems (Class A) will still run more efficiently than a traditional electric or gas water heater in below-zero temperatures. If you live in a colder part of the country, ask your manufacturer if their system is designed to work at low temperatures. Ask to see performance results at different temperatures for the model you are thinking of buying. Ensure that the system is “Class A Rated – suitable for cold climates” when installing south of Auckland. This means it has an active defrost cycle. Select a model that achieves an energy saving of at least 60% for your climate zone; ensure that the system is compliant to AS/NZS2712:2007 and that the tank is NZ MEPS rated. 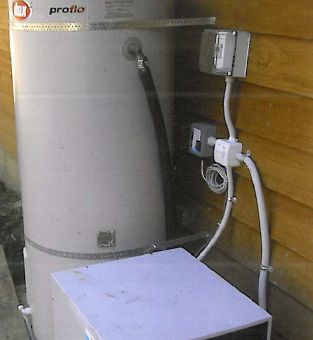 In April 2009 Consumer NZ (with the support of EECA) carried out tests on the performance of six heat pump water heaters suitable for household use. The complete report can be accessed free of charge from the Consumer NZ website www.consumer.org.nz/reports/heat-pump-waterheaters. In 2009, EECA introduced a Heat Pump Water Heating (HPWH) Pilot scheme designed to collect data on the energy and economic performance of a range of residential HPWH technologies installed in different regions of New Zealand. The report details the finding of that pilot scheme and can be found at www.eeca.govt.nz/node/11863. This is general advice. We recommend you get more specific advice from your local EDA, where available. Call 0508 326-337 (0508 ECO DESIGN) or visit www.ecodesignadvisor.org.nz – free, independent, informed advice on creating homes that are healthier for you and the planet. Original information from EECA Energywise website (accessed August 2012) and BRANZ Build 116 (Feb/Mar 2010) article Water Heating Options, by Albrecht Stoecklein. Updated with additional commentary and costs by EDAs and reviewed by Adrian Kerr, Project Solar, October 2012.